The benefit has failed to keep pace with wages over the past 40 years. In my column in this week's magazine, I look at how the value of unemployment benefit has fallen over the last 40 years. There wasn't space to include all of the data in the magazine, so I thought I'd share some more of it here. As the table below shows, unemployment benefit rates (£5) represented 19.2 per cent of average weekly earnings (£26.10) in 1970. 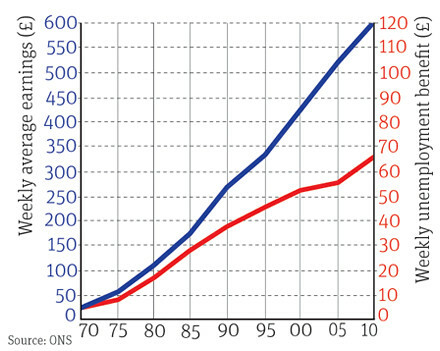 But the Tories chose to raise benefits in line solely with prices from 1980 onwards, with the result that the replacement rate (the percentage of an old wage that a new benefit replaces) fell to 16.6 per cent in 1985. First Major, and then Blair, stuck with the policy change and benefit rates fell to 13.8 per cent in 1995 and to 12.2 per cent in 2000. Today, Jobseeker's Allowance (currently £65.45 a week for a single person aged 25 or over) is worth just 10.9 per cent of average weekly earnings (£600.90). Had JSA risen in line with earnings, as the graph below shows, it would now be worth around £120. Ahead of the Budget on 23 March, I argue that the coalition should recognise that there is an economic as well as a moral case for raising benefits. Low earners spend a greater proportion of their disposable income than high earners and stimulate the economy as a result. Almost no one but the TUC has made this argument; it deserves a wider hearing. As unemployment continues to increase, pressure for a fair deal for the jobless will grow.